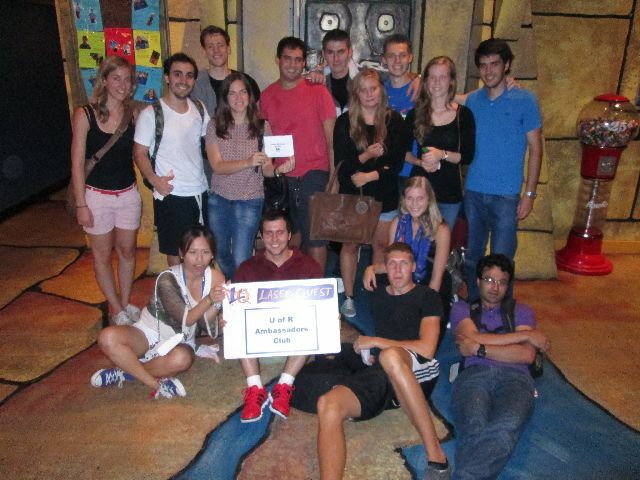 The Ambassador Club organizes new international students, or ambassadees, into groups with other ambassadees and returning students who volunteer as ambassadors. Ambassadors welcome new international students to campus, introducing them to various aspects of campus and U.S. life. Each group meets at least once per month, doing activities such as eating a meal in the dining hall, attending UR sports events or the International Film Series, or visiting historical and cultural sites in Richmond and around Virginia. Ambassador Club members are encouraged to attend the monthly events and trips organized by the Ambassador Coordinator each semester. The Office of International Education will reimburse ambassadors up to $25 per academic year for a meal or activity to which they have treated their ambassadee. We are hiring for Ambassador Coordinators for 2019-20! Do you have trip planning and event organizing skills that you want to use to help new international students get to know Richmond better? Apply to be an Ambassador Coordinator for the Ambassador Program, which pairs new international students with returning UR students in a social “buddy” program. If interested, please email a cover letter and resume to Krittika Onsanit at konsanit@richmond.edu. Candidates selected for an interview will be contacted by email. The position is open until filled. Cassidy Perkinson is a rising senior majoring in Leadership Studies with a minor in Psychology. She spent the fall semester of her junior year studying in Milan, Italy. While abroad, she interned at an ESL company where she helped teach local Italian students English. Through this internship, her passion for international education grew, which inspired her to get involved with the Office of International Education and the Ambassador Program. Cassidy is a Tour Guide, a Resident Assistant, a member of Alpha Phi Omega, and a volunteer at Youth Life. She is excited to meet and work with all of the international students this fall! My name is Nadiya Narula, and I am a current junior at the University of Richmond from Brazil. I am a major in Global Studies with a concentration in Politics and Diplomacy. I love traveling and have actually been to 39 countries, with the hope of seeing at least 39 more. Meeting new people has always been one of my favorite things, and I cannot wait for this year to be the best so far!